Cholesterol Diet Info: Understanding Cholesterol and Why we Have to Follow a Controlled Cholesterol Diet. Always remember, not all cholesterol is the same - it is important to maintain or increase the good cholesterol while lowering the bad cholesterol and this is achieved largely by adhering to a low cholesterol diet. You also need to keep your blood pressure controlled if you are to extend your life. Focus your diet on eating the good cholesterol to increase your good cholesterol levels? So one of the more interesting questions I took to answering, was when a visitor to this site emailed me and asked if '..eating good cholesterol would increase the good cholesterol in him?'. It was an absolutely unique question, one that just begged a simplistic positive answer, but, alas, it wasn't so. Cholesterol as you most likely know, is a fatty substance that is transported around the body in the blood stream - for all intent and purposes, the cholesterol contained in both good and bad cholesterol, is the one and the same. Why is one then called bad and the other good in your body? The one called good is being carried out of the body and hence will not hang round to cause any mischief, while the bad cholesterol is called that because it is ear marked for body use and will remain in the body until it is used up in cells as energy, or stored as fat, or drops out of the blood and starts blocking the blood vessels. How does the body tag or earmark the cholesterol for either good or bad? To the body, there is no such thing as bad cholesterol, bad cholesterol is the way we humans describe excess cholesterol. Well, bad cholesterol is the left over cholesterol - the excess cholesterol to our needs that is the real baddy. Initially cholesterol is carried in our body in little 'cargo boats', medically referred to as "low density lipoproteins (LDL)" - when an LDL boat has cholesterol (C) loaded into it, the boat is named LDL-C. Cholesterol without this cargo boat would sink out of the blood and build up real real fast in the arteries, as this fat is not water soluble - but this carrier boat keeps the cholesterol floating and moving in the blood, until the cholesterol is either put to use or the ship sinks so to speak. When the LDL-C boat sinks, that's when the problem starts, as they may accumulate on one or more blood vessel walls ( ocean floor so to speak). The more that accumulate from this LDL-C sinking, the more likely will be that they will build up forming a partial blockage (narrowing). The build up of cholesterol on an area of a blood vessel wall is medically called "plaque"
It is unlikely that the bad cholesterol will completely block the blood vessel off, but scientists have found that the blood vessel "grows" a layer over the blockage to protect the blood vessel from it, but the layer remains thin and weak and when the layer breaks open for whatever reason, the body produces a blood clot to fix the damaged blood vessel. A partially blocked blood vessel with a clot produced to repair the skin breakage - well the clot can be big enough to get stuck in the narrowed portion and that means a stroke. LDL boats come in different sizes - the smaller the LDL boat the more likely it is to sink. So one of the cholesterol tests your doctor may ask you to get is one to detect LDL Pattern B (assessed indirectly by triglyceride levels). This type of boat is quite, quite small and therefore much more dangerous being much more likely to sink and attach to blood vessel walls. If you are a male, there is a 33% risk that you will have too many of these boats, and if you are a woman, the risk is about 14%. If you have high triglyceride levels, as measured by a fasting blood test, then you are most likely to have LDL Pattern B. LDL Pattern B is typically treated by prescription strength Niacin and within 6 months the risk of heart attack / stroke is greatly reduced. Good versus bad cholesterol - the basis of the cholesterol ratio. So, when we eat cholesterol in our diet, we absorb it and the body immediately loads it all into the cargo boats. So it matters not what sort of cholesterol we eat, or where it mostly comes from, to the body it is just cholesterol it loads into LDL boats. So if our diet is high in cholesterol, that often can mean our body is launching a lot of cholesterol loaded boats - making our LDL Cholesterol quite high. Too many LDL-C's, not enough HDLs, means the cholesterol that has sunk to the blood vessel wall may eventually build up into a blockage in our blood vessel and if you block an artery or any blood vessel - medically called a "Stroke" - lots of things may die that depended on that blood vessel for their life. For example, block a blood vessel feeding the heart, and you have the "heart attack" with part or all of the heart dieing. If its a partial blockage, then the bits that depend on that blood vessel for survival become starved of oxygen and can cause pain and distress until the oxygen is present again - this can cause angina (heart chest) pain when you are physically active for example as the oxygen needed by the heart to pump faster just isn't there in enough quantity if the blood vessels feeding the heart are partially blocked. The Interaction of Cholesterol and Inflammation to increase risk of stroke and heart attack. Cardiovascular disease and cholesterol has a go between that can determine if high cholesterol is going to be particularly dangerous. The middle man is the condition of the blood vessel. If the blood vessel is inflamed - which seems unimaginable, but it can be so - then when ships crash into the wall they are more likely to wedge into it instead of bouncing off; the area of the ship wreckages is more likely to disintegrate over time. When this happens, the body tries to repair the blood vessel by making a clot to cover the area that is breaking up. If that blood clot blocks the blood vessel, then you have a stroke there and then, if the blood clot comes loose, then the stroke may occur where the blood clot comes to rest. Treating inflamed blood vessels is easy too, aspirin or cholesterol drugs can do that. Homocysteine - an amino acid - developed quite a reputation for being a potential cause of blood vessel inflammation. If you have high homocysteine levels, your doctor may increase your folic acid, B6 and B12 intake to bring the homocysteine levels down. We know that inflammation of blood vessels also appears to be associated with smoking, high blood pressure, high cholesterol, diabetes and some other things, so getting them under control may help ease the inflammation in your blood vessels too. To test for inflamed blood vessels, they do a test called a C-reactive protein (CRP) test. Another piece of the puzzle also appears to be lipoprotein (a) - lp(a) - it is a cholesterol particle as well, that is believed to contribute to making and or triggering blood clots into being. About 15 to 30% of those with early cardiovascular disease have high lp(a). Lp(a) can be treated with prescription strength niacin and or oestrogen. When a boat (LDL) contains cholesterol (C), it is referred to as LDL-C, when a dredge (HDL) has picked up cholesterol it is referred to as HDL-C, but to all intents and purposes LDL and LDL-C are used to mean the same thing, while HDL and HDL-C also are used to mean the same thing. For more about the technical side of HDL, LDL and other terms. Our bodies do have the ability to control cholesterol levels, so what goes wrong? Cholesterol comes from two sources, diet and internal synthesis. Many of the foods we eat on a daily basis have cholesterol already in them, and our own body makes cholesterol out of the things we eat, especially when the diet is high in cholesterol and high in saturated fats ( saturated fats are like rocket fuel for cholesterol production - the body quickly converts saturated fats to cholesterol in the body. Therefore, if your diet is high in cholesterol and saturated fats, then you may have a problem with high cholesterol levels. In addition, if your body synthesizes (makes / creates) too much cholesterol, you may also have a problem with high cholesterol levels no matter what you eat, but minimizing the cholesterol and saturated fats in your diet can help considerably. 1. High cholesterol often comes from bad diet and little exercise, over many years, BUT WHY? In other words: "Why does bad diet and little exercise cause high cholesterol when the body regulates cholesterol levels so well?" The answer is very complex, but I can oversimplify it very easily: "Cholesterol production within the human body is increased as fat cells enlarge and increase in number, while cholesterol is used up a lot in the muscle tissue." In modern society, we overindulge in food and put on weight, and we also exercise less, causing our muscles to wither. So we have the double whammy of obesity and little muscle tissue at the same time, which in turn can cause high cholesterol. OR to put it another way, we damage the bodies ability to regulate cholesterol and with the dietary bombardment of foods high in saturated fats and cholesterol, our cholesterol levels go too high. So if your cholesterol levels, numbers, ratings are high, then yes, you do have a potentially life threatening situation on your hands, but as cholesterol builds up slowly, you typically have plenty of time to lower and achieve normal cholesterol levels, and avert your impending induced disability or worse. In other words, you body is designed to overproduce cholesterol from saturated fats and cholesterol found in the diet. In its day, the ability to overproduce may have kept you alive when times were tight and starvation was never far away, but in to days times of plenty, it has become a curse for now. So you can see why anyone with high cholesterol has to adopt a diet to control cholesterol and saturated fat intake. As the internal synthesis seems to be regulated by genetics, if your family has had a problem with high cholesterol in the past, you may want to have your cholesterol levels checked yearly. Well, if your high cholesterol has created deposits in the arteries feeding the heart, you have cardiovascular disease, and the heart disease that occurs from an artery becoming blocked - the heart attack - causes the heart to stop beating or not beating right, then, even if you were to be given immediate CPR, your chance of NOT being resuscitated is 90%. If you are lucky to be amongst the 10% who live, you run a 10% chance of remaining in the hospital for the rest of your life. Cholesterol is dangerous - very few people get a second chance when they ignore their high readings or fail to control it. What you may not realize is that a cholesterol caused stroke could occur anywhere in your body. If the cholesterol doesn't kill you, it can still be very disabling. I saw a photo of foot that had had a stroke. It looked yuck and the person may have been going to lose it. People can lose their eyesight when cholesterol deposits build up in the blood vessels feeding the eyes, even dementia may result from the effects of buildups in the veins and arteries feeding the brain. You may feel well, but it can still be doing it's thing... That's why cholesterol is called a silent killer. Education is your main defense - without the knowledge to treat your cholesterol, you will most likely die, after, maybe, suffering several serious heart attacks and strokes, which may leave you more and more disabled each time. Very seldom will high cholesterol lower of it's own accord. The typical outcome is for it to just get worse, slowly and silently killing you as the months and years progress. My father died about 30 years ago from cholesterol related heart disease, when I was just 21. A triple bypass operation gave his life an additional ten years, but he remained always weak and needing to rest. Understanding and controlling cholesterol was new in his day. Yes, he was advised to follow a special diet - avoid foods like butter and eggs, use margarine, eat fish, avoid fat - that was about the most they could tell him. When I came down with high cholesterol, the doctors and dieticians gave me the same advice that my dad received - and that didn't really help him that much. Let's face it, when you look round this web site, you can understand why doctors and health professionals cannot possibly hope to impart this level of information to you - the information you need to succeed is enormous and many cholesterol sufferers do repeatedly come back to this site to gain more and more information. Lowering cholesterol naturally means that you are avoiding cholesterol medications. Cholesterol drugs are life saving if you cannot lower your cholesterol naturally, but those drugs often bring with them a whole host of side effects, and those side effects can sometimes - rarely - cause such bad side effects, that the high cholesterol may have been the better option. That's why it's so important to learn to lower cholesterol naturally, to learn about cholesterol diets, cholesterol meal planners and sample diets to lower cholesterol. It's important to learn about how to lower cholesterol naturally and safely, while only pursing the use of cholesterol drugs when absolutely necessary. There are also cholesterol supplements that can help. Cholesterol dieting - It's BIG changes in your diet, not little ones that are needed. Too many people make some changes and then mistakenly believe they have done enough, only to find things haven't changed at the next doctors follow up and cholesterol drugs may then be prescribed. So, when we get the diagnosis of high cholesterol, look at major diet revisions - little ones don't help much. With a good low cholesterol diet we aim to increase the good cholesterol, while lowering the bad cholesterol - one that both fosters the reduction in cholesterol we are absorbing from the eating and drinking in our diet and one that also fosters the use of certain foods and drinks that are known to increase the good HDL cholesterol. Winning against cholesterol isn't easy, but it is possible. 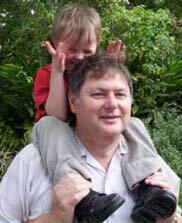 This is me, with my youngest, taken a few years back, when I had high cholesterol, prediabetes, and metabolic syndrome. By keeping a close check on my levels, following my own low cholesterol diet, adding foods that lower high cholesterol, I was able to defeat it naturally, with no supplements at all. Heres some basics of a cholesterol diet to help you a long, but remember that most most of this site is cholesterol diet focused, so don't read this little bit and think you know it all. Many people who suffer from high cholesterol, whether genetically determined or not, find relief and help through natural dietary changes. Cholesterol is found in any and all meat or animal products. The most common sources of dietary cholesterol are beef, poultry, egg yolks and shrimp. A popular misconception is that meat contains no cholesterol, only the fat, so by removing the fat, the cholesterol was also removed. WRONG. Lean meat has about the same amount as regular meat. However, there is a significant reduction to be gained from removing the fat, as animal fats fuel the cholesterol synthesis in the body - types of fats are also explained here. So both vegetable and nut cooking oils are AOK. You'd have to drink two and a half gallons of pure peanut oil, which is one of the highest in cholesterol, in order to equal the cholesterol intake of just one egg yolk. However, choosing vegetable oils according to use can be helpful in reducing other problematic dietary factors such as oleoresin and free radicals. Cholesterol is a necessary cell building block and it is synthesized within the body as well as being part of any diet. Even if you're a vegan, if your body is geared to produce a lot of cholesterol you may need medication in order to regulate the metabolic process responsible. Up to one quarter of daily cholesterol production happens in the liver, while the rest of it is created in the intestines, reproductive organs, and the adrenal glands that sit right above the kidneys. If you suffer from high cholesterol, an educated systemic approach is your best tool to living a long and happy life free of cholesterol-related health problems and anxiety. I know, because I followed this cholesterol information and won my battles with flying colors. No more high cholesterol, no more pre-diabetes, no more high blood pressure, no more metabolic syndrome and no more food intolerance's. Believe me, my life depended on me getting things right - even the specialist thought I was too far gone. May you do as well as I and have a long and happy life ahead of you, full of health and vitality. This page contributed to by Loni Ice and written and edited by Donald Urquhart.